For a moment, the White House looked like a dance studio as First Lady Michelle Obama welcomed dancers of all types to the East Room as part of a new series. Alvin Ailey dancers pirouetted and swayed as they performed excerpts from the company’s legendary work, “Revelations.” But all eyes were on the day’s honoree, legendary dancer and Alvin Ailey artistic director, Judith Jamison… Mrs. Obama beamed as she praised Jamison’s contribution to the arts, calling her “an amazing, phenomenal woman” whose work had been an inspiration to her and the President. 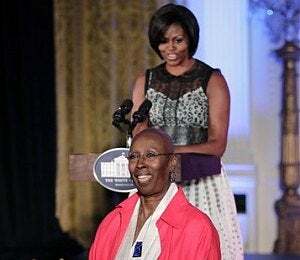 “In so many ways, Judith Jamison embodies that spirit — a spirit that is alive in all the dancers she’s inspired, in all the pieces she’s perfected, in all the audiences she has moved and uplifted,” she said. 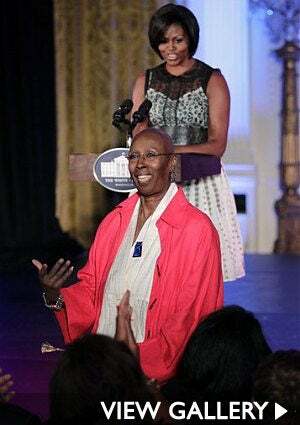 Judith Jamison has been an inspiration indeed. Check out this legendary dancer’s life in pictures.